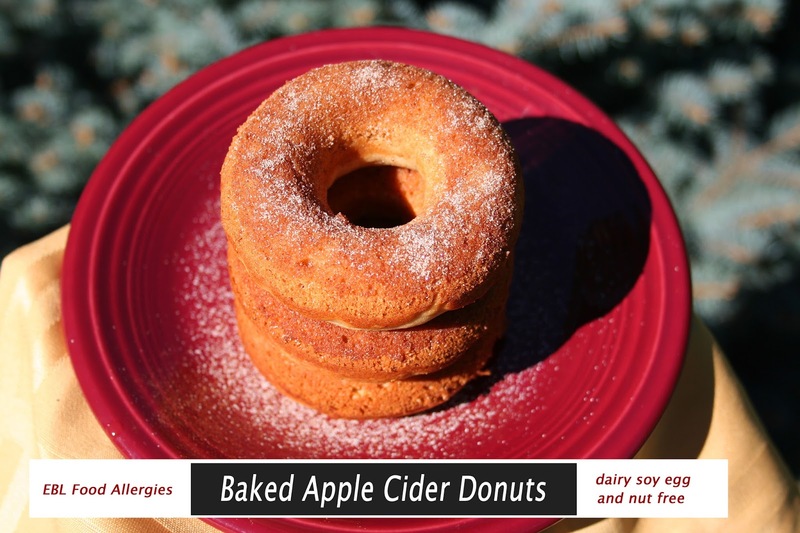 These easy Baked Apple Cider Donuts are dairy free, soy free, egg free, and nut free. I made them with wheat flour but they can easily be made wheat free and gluten free by substituting with a gluten free flour blend. My family and I went apple and pumpkin picking this morning. 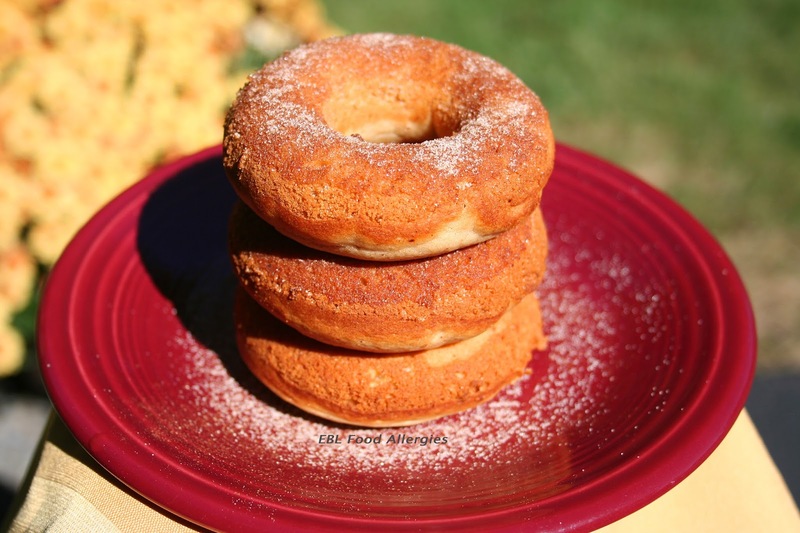 I wish I had thought to pick up some apple cider at the store to make these donuts BEFORE going apple picking, but live and learn. Next year I’ll remember to bring the donuts with us already made. The smell of freshly baked cider donuts was overwhelming when we stepped inside the country store. We couldn’t resist buying some donuts that were still warm and fresh out of the oven. Mmmmm… My son only had to wait about 15 minutes after we got home for me to whip up a half a dozen allergy friendly donuts. They were sooo easy to make and better than the ones from the apple store IMO. On to the recipe, let’s be honest here…it’s why you’re here, isn’t it? Lightly grease donut pan with oil. Mix first five ingredients together in large mixing bowl. Mix oil, cider, sugar, honey, and egg replacer mixture together in a 1 cup measuring cup. Pour wet ingredients into the large mixing bowl with the dry ingredients and mix well. Empty contents into a gallon size plastic bag, snip one corner off and pipe the donut mixture into the donut pan. Cook for 11-14 minutes and allow to cool. Pour 1/4 cup apple cider into a small dish. 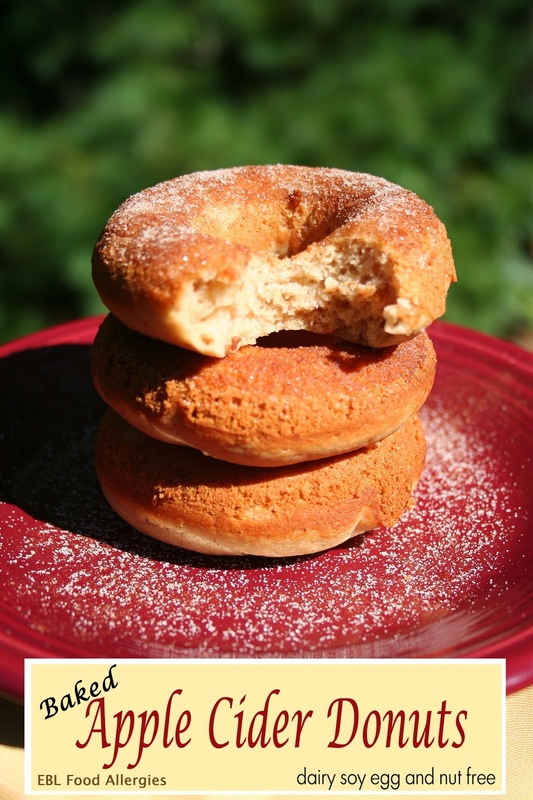 Dip each donut into the cider and sprinkle with the cinnamon sugar. If you liked this recipe, you may also like Autumn Madness Muffins. I know we did!!! What do you use for "cooking oil"? Just whatever safe oil, like vegetable, canola, etc?